Attempting to grow a lush lawn under less than ideal conditions typically becomes a battle not worth fighting. Most lawn grasses require a full sun location and regular waterings to look their best and thrive. Healthy, bioactive and well-draining soil is also a requirement for a good looking lawns. Some locations are just too difficult to mow, such as steep slopes and easements. Maybe you’re just tired of the weekly maintenance and resources that go into keeping up your lawn or need to reduce supplemental irrigation. While lawns definitely have their place and uses, sometimes replacing the lawn with low-maintenance groundcover plants is ultimately the best solution. Ripping out the entire lawn might seem extreme, but if you live in a part of the country with tight water restrictions, then replacing lawn grass with more drought tolerant plants is a smart choice. Replacing lawn grass with more drought tolerant plants is a smart choice. 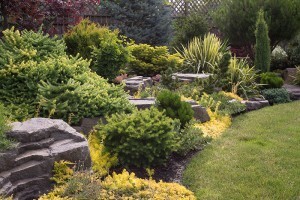 Evergreen shrub groundcovers, such as junipers, are an excellent option. Dwarf varieties are good choices for creating green buffers along easements or property lines without obstructing views. Juniperus tamariscifolia, also known as Tam juniper, is a dense evergreen shrub that grows wide and low. Branches arch gracefully outward to 10-feet in width, with plants reaching a mature height of only 18”-30”. 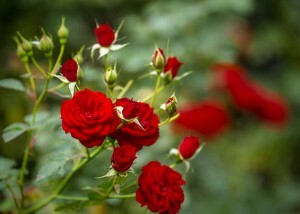 Plants can be tip pruned to keep them more compact. If you have a large area to fill in, the this could be the ideal selection. Once established, it’s a very drought tolerant groundcover. If you’re looking for an evergreen ground cover with a unique foliage color for contrast, be sure to consider old gold juniper. Juniperus x pfitzeriana ‘Old Gold’ is a compact evergreen shrub with bronze-gold, scale-like foliage. Plants grow in a graceful, horizontal tiered fashion, giving them an architectural or sculptural feel. Perfect for creating a unique, low-growing focal point in the landscape. New growth is lacy and golden colored. The foliage color is the perfect complement to dark green and burgundy foliage plants. Old gold spreads to about half the width of tam juniper, so at only 5-feet wide and 2-3’ tall, plants will fit in a more compact space. Low-maintenance doesn’t have to mean unattractive. These lush evergreen junipers help add color and volume to your most difficult landscape areas.